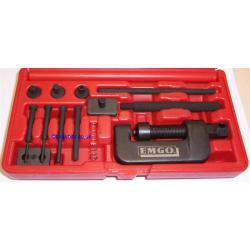 Heavy Duty Chain Riveting and Breaking Kit. Suitable for all chains up to 530, and also camchains. Supplied with four bits for chain breaking, and three anvils for riveting, please click on the thumbnail to enlarge the image. Supplied in a strong blow moulded case for storage.